Are you the "everest brand" or do you sell the Everest brand that is sold at Walmart, dunhams, etc? What happens if I want to return or exchange my order? We send out automated emails when we process your order and again when we ship your order (your tracking number will be emailed directly from UPS or USPS, depending on how your package was shipped), thus you should receive all your status updates by email. Furthermore, there is a status link in your confirmation you can click to check your current status. We have found that this is the fastest and most efficient way. What if I did not get an email confirmation for my order? After placing an order, a receipt will be sent to the email you provided when placing the order. In the event that you cannot locate your receipt, here are some tips. 1. Check your spam box to see if your receipt was sent there by your email system. 2. 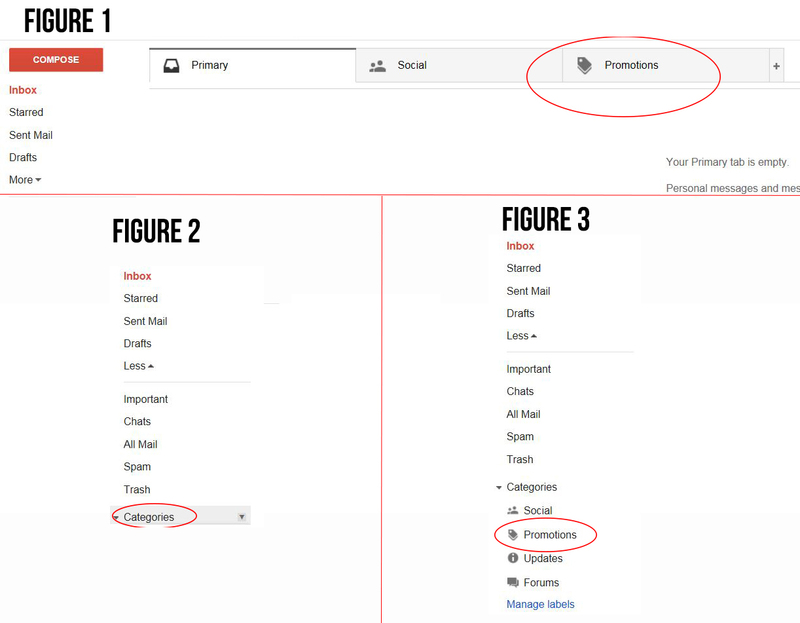 For Gmail users, check your �Promotions� Tab (See Figure 1)- our emails often end up there. 2A. If you cannot locate the Promotions Tab, you can find the promotions label on the left-hand menu of your email page by following these instructions: Click the �More� tab located toward the bottom of your email folder list, then click �Categories� (See Figure 2). You should find the promotions box there (See Figure 3). 3. If you have checked all of your appropriate folders and still cannot locate your receipt, call us at 740-587-1490, or email us at webmaster@everestgear.com and we can further assist you. What can I do if I need my order by a certain date? We offer a variety of shipping options available when checking out with your online order. To view estimated* shipping costs make sure to input your zip code before changing your shipment method (See our Shipping Info page for more details) If you are still worried about your order reaching you on time, you may leave a note in the �Comments� box during checkout, or you can call us at 740-587-1490 to confirm your package�s likely arrival date. What happens if my item is backordered? We will email you or call the number you provided when placing your order to tell you that your item is backordered. You can choose to have the item sent when it is in stock, you may replace the item with a suggested similar item, or you may choose to cancel the order entirely. Will I receive a paper receipt with my package? We do not send a paper receipt with you order. In order to conserve paper and resources, we send your confirmation (your receipt) by email so you may use that for your records. What if I want to add an item to an order that I�ve already placed? You can place another order and write a note the �Comments� box at checkout that you would like to add it to your previous order. Note: this is only possible if your previous order has not yet shipped. What if I don�t want to give my email when placing the order? We will need your email in order to send you an electronic receipt for your purchase as we do not include receipts in packages. We do not sell your information nor do we put you on a spam list. We will only email you your confirmation and tracking number. Under no circumstances do we abuse your information that you give to us. What does it mean when an item says CALL or OUT OF STOCK and still on web? If the item says �Out of Stock� or �Call� it means that we currently do not have any stock of the item in our warehouse, but we might be getting more in so we have not removed the item from the site. Please email or call us if you would like a status update on a particular item.